Mickey Basin is a 4-mile long depression in the dry desert playa in the shadow of the Steens Mountain in Southern Oregon. Mickey Hot Springs and Mickey Butte are the two notable attractions in the basin. 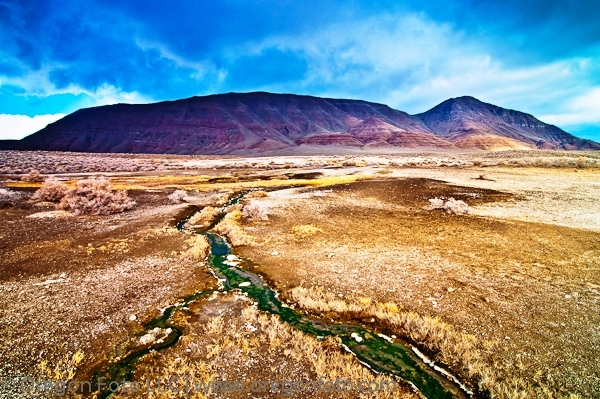 Located north of the Alvord Desert playa, the basin is split into two distinct valleys by a dark ridge that runs south from the Sheepshead Mountain Range. Mickey Butte is the highest point of this ridge at 6,294 feet. 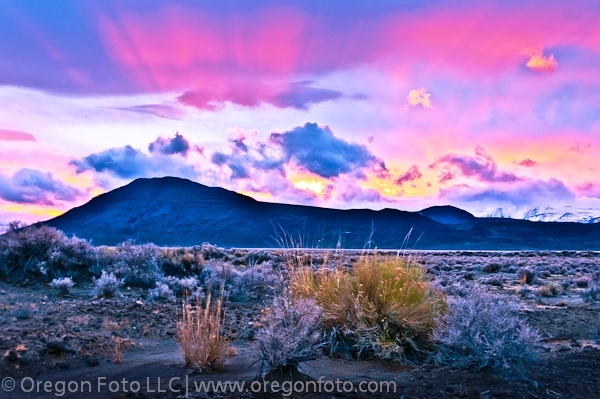 This alkali flat desert is one of the most remote and sensationally wild locations in Oregon. Attracting few visitors a year willing to make the long drive with many on gravel and dirt roads, it is an ultimate destination for those seeking a solitude camping experience in the true Oregon outback. 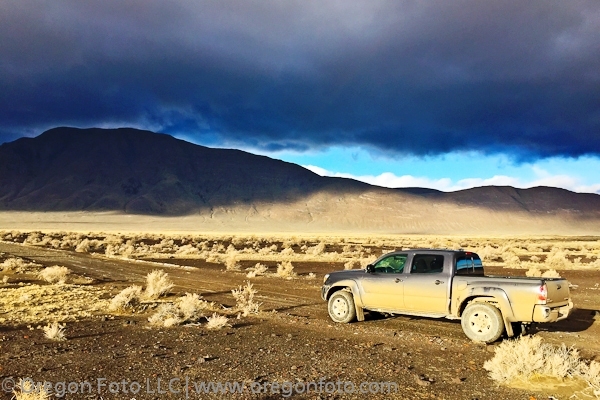 Nearby, and better known, the Alvord Desert stretches 6 miles wide and 11 miles long during the dry season after the runoff from the Steens has abide and the sun has scorched the playa to a truly dry and barren desert landscape. During the wet months, the playa is a shallow alkali lake posing a much contrasted scene from the more desirable desert playa. A few miles north is Mann Lake which is located below the east-face of the Steens Mountain. This desert oasis attracts anglers with its abundance of Lahonton cutthroat trout which have adapted to survive in the alkaline desert waters. Truly a destination for recreation, the Alvord Desert is popular for camping, hiking, land sailing, glider flying, recreational driving, rockhounding, photography, and wildlife viewing. However, for those looking to expand on an Alvord trip, or would like to drive north of the famed playa on a rather rough dirt road, head to Mickey Basin where other travelers will be far and few between. The reward is a sense of exploration when visiting Mickey Hot Springs or taking a hike to the summit of Mickey Butte. The best part is setting up camp wherever you like in the expansive Mickey Basin and likely have the entire place to yourself. At night, with no ambient light from the moon or nearby development, you can see a sky filled entirely with stars and constellations in a cloudless sky. You may wish to plan a trip timed with the Perseid meteor shower which is around August of each year and is one of the brighter and easiest-viewed meteor showers. The Perseids are widely sought after by astronomers and stargazers. This is because at its peak, one can see 60 to a 100 meteors in an hour from a dark place, and there is no place darker than the desert surrounding the Alvord. At evening, it is pitch black and there is no sound whatsoever, which lends a mystical feel to the air while sitting around a campfire. Mickey Butte, which is the highest point in the basin, has actually 1,964 feet of prominence this is noteworthy given its proximity to the mightier Steens looming in the distance. The face is dark and triangular, with portions of steep cliffs of stacked basalt. On a cloudy day, the face can look solid black and very menacing. Vegetation is sparse with dried grasses and occasional sage brush. The starting point for the hike is at the dirt parking area for Mickey Hot Springs. Face north and begin through the sage brush in the parking area. The climb is a moderate but steep hike and the route is easy to follow, and more or less, you make your own path. The total distance is 2.3 miles with 2,300 feet gain in elevation. At the summit, the reward is an incredible view of the Alvord Desert, the surrounding Sheepshead Range, and most of all, the eastern face of the Steens Mountain. Mickey Hot Springs is the first attraction on the way to the deeper Mickey Basin. This protected geothermal site is an entirely undeveloped and natural hot springs. 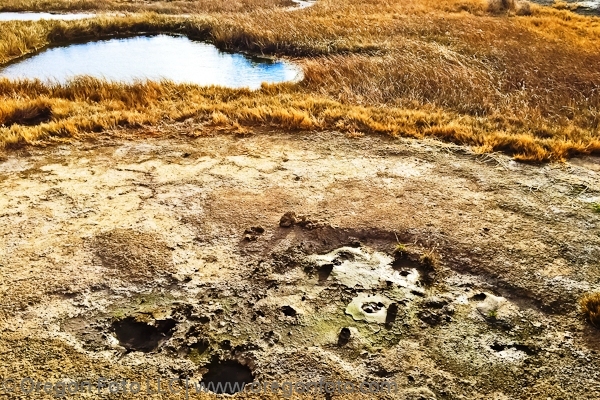 There are several natural bubbling mudpots, steam vents, and a tiny geyser. Think of it as Oregon’s version of a mini-Yellowstone, with emphasis on mini. The BLM (Bureau of Land Management) has built a fence surrounding the 20 acre area with a warning sign to stay clear of hot springs since the water is at boiling temperature and too hot to soak in. It has been said that there have been death of pets and a visitor who had a heart attack soaking in the 117 degree Fahrenheit water. Some of the vents reach up to 212 degrees Fahrenheit. There is however an old dugout pool below the main hot spring were the water has cooled to a tolerable soak of 105 to 115 degrees Fahrenheit for those who do not heed the warning. You must be observant and cautious while exploring the area since there are no barriers or protection from any of the small steam vents and pools. Down the hill from this pool is where the rest of the geothermal activity is located with several steam pots and small areas where the mud is bubbling. Over the years, the course of the overflow has changed and the geothermal activity waxes and wanes due to water levels in the surrounding area. Driving past Mickey Hot Springs takes you to Mickey Basin where the road changes from manageable by passenger car to a highly recommended 4WD, especially if rains come as the road turns to a slick and sticky goop. There is a sense of adventure driving an additional 5 miles as the alkali basin is surrounded by the Sheepshead Mountain Range and you are venturing into what feels very other worldy. From here, Mickey Basin is evident as you can view its oval shape with the mountain sides helping to define its shape. On a dry summer day, you can likely drive around the basin with proper high clearance 4WD, but in times of transition from wet, you may likely end up traveling as far into Mickey Basin as your comfort level will take you. To the north and slight west of the basin are the ruins of an old rock home with just a foundation and two half-remaining walls made of stone. Set up camp wherever you desire, as you will most likely have the place to yourself. So Mickey Basin, despite being barely a blip on a map, and a rather long and moderately difficult drive to reach, offers quite the adventure. From hot springs, to a summit climb, and a beautiful celestial sky above a roaring campfire to a spiritual awakening by the Sri Yantra, Mickey Basin is a top destination in Oregon for those seeking solitude and enlightenment. 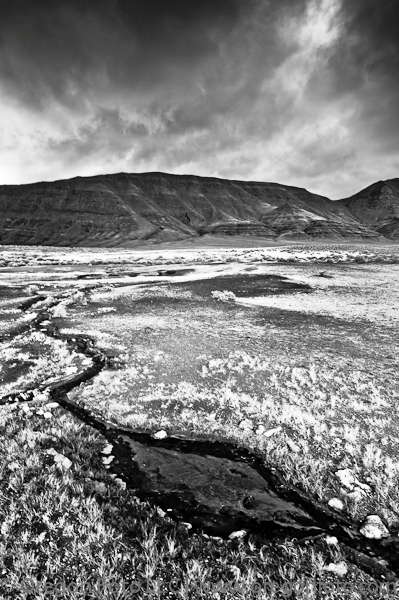 For more pictures of the Alvord Desert and Steens Mountain, visit http://www.oregonfoto.com. To find Mickey Hot Springs from Burns, continue east on OR Hwy 78E Monroe St toward Crane. After 64.6 miles, turn right onto Folly Farm Rd / Fields-Denio Rd toward Fields. This is the main road headed to the Alvord Desert. After 11 miles the road turns to well-maintained gravel and after nearly 20 miles (just before the road makes two 70 degree turns), turn left onto an unmarked dirt 4×4 road which takes off to the south. Follow this unmarked road south and east for a little more than 6 miles to the Hot Springs. Along the way you will see less traveled roads that shoot off to the sides, so pay attention and remain on the road that appears to be the most used; this is the one to follow. To continue onto Mickey Basin, follow the road from Mickey Hot Springs for approximately 5 more miles. The coordinates to Mickey Basin are 42.7496882,-118.3100173. If you enter this into Google Maps, there is a good visual of this road system that shoots off of the main Fields-Denio Road that is described above. In wintertime, this road may be muddy, but given that it is mostly gravel and sand to Mickey Hot Springs, a passenger car should make it. High clearance 4WD is recommended at any season to drive further into Mickey Basin. Be sure to have plenty of gas, as the only stations are Burns to the north and Fields to the south. There is no water.